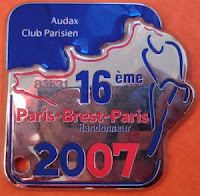 The 1200k cycling event Paris-Brest-Paris (PBP) will be held from August 21 - 25, 2011. According to the president of the Audax Club Parisien (ACP), the parent organization of PBP, no Korean rider has ever finished this crueling event in the 100 year history of PBP. Do you want to be the first Korean to accomplish this magnificent achievement and ride PBP in less than 90 hours? If you plan to ride PBP, you will need to qualify by successfully completing the entire Brevet series (200, 300, 400, 600k). Moreover, the 1000k Brevet would serve as another good test. The image shows the medal awarded to successful riders. For more information, contact Lothar Hennighausen. 1200k 사이클링 이벤트 파리 - 브레스트 – 파리 (PBP)는 2011년 8월 21- 25동안 개최됩니다. ACP회장에 의하면 100년 동안 개최된 PBP 이벤트에서 완주한 한국인은 아직까지 한 명도 없었다고 합니다. 바로 당신이 이 굉장한 성과를 달성할 수 있는 첫 번째 한국인이 될 수 있습니다. 만약 PBP이벤트에 참가하길 원하신다면, 200, 300, 400, 600k Brevet 시리즈를 모두 완주하셔야만 합니다. 더 자세한 정보가 필요하시다면 Lothar Hennighausen에게 연락 주시기 바랍니다. Do you think I can ride entire Brevet series in Australia and go PBP with you and be the first(or one of first time) Korean PBP finisher(s)?